If Asher Hearst had a superpower, it would have to be his ability to take a punch, laugh it off, and keep on swinging. So yeah, immortality comes with a few perks. As a college student slash small-time fixer, he's about to take a job that's best left to the pros. A proposition by a dryad to save witches from the Inquisition is a first, but he isn't one to balk when the odds are stacked against him. Especially not while he's drinking on someone else's dime. 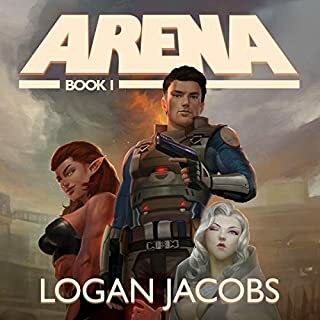 The powers that be in the supernatural world aren't anything to sniff at, so it should come as no surprise that Asher gains his fair share of enemies. At the very least, you'd think traveling across space and time would put him on a path towards a promising future - maybe even give him a shot at romance? Yeah, right. 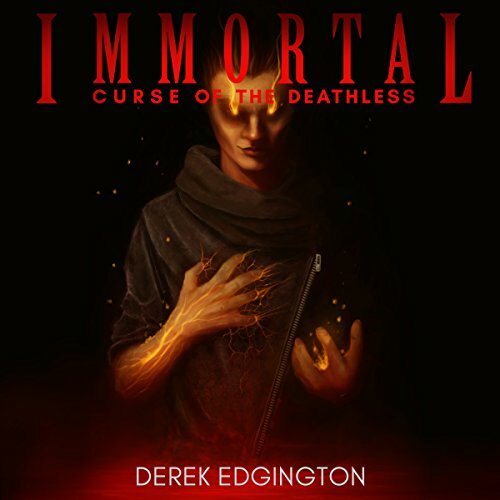 Immortal: Curse of the Deathless is an action-packed, dark and gritty comedy with a dash of horror. Over its three parts, the book spans a contemporary, urban setting, as well as Tír na nÓg, the demesne best known for being home to the Fae (Sídthe) from classic Celtic Mythology. This audiobook is very good. It has an immersive plot, fun characters, lots of action and adventure. The protagonist Asher is quirky, fun, and a little bit weird. 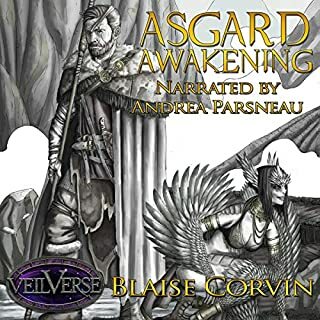 If you crave a grand adventure chock full of sarcasm, action, adventure, magic and just the right hint of romance, I urge you to pick up this audiobook. Immortals, witches, weres, fey, and other things populate this book. The main character is a young man who is immortal. I think there was a prequel I missed when he realizes this because there were several references to past events. I did enjoy this but there were several things that prevent me from giving it 5 stars across the board. There were a few errors in either pronunciation or grammar that I noticed and distracted me. In addition to the regular blood and guts fight scenes (which I could handle), there was a torture scene which was too much for my tastes. Also, the ultimate bad guy that they ended up fighting was almost cartoonish - I liked the earlier, more believable bad guys. The book ends in an obvious "there is a sequel" coming way with some loose ends still out there. So, with those caveats in mind, I do recommend it. What did you love best about Immortal: Curse of the Deathless? I absolutely loved the way the book was written - Its pacing was perfect and it had an excellent mix of humour and action. The author definitely knows what he's doing and I was always left wanting more. What other book might you compare Immortal: Curse of the Deathless to and why? I feel like this is slightly similar to some of James Patterson's novels, particularly the Max series - There's never been much to satisfy my craving for more of the franchise but this definitely did the job! What about Nik Magill’s performance did you like? I feel like the narrator's performance was fitting to the tone of the book - You could hear the emotion in his voice and personally, I felt incredibly engaged throughout. I'll definitely be on the lookout for more of his work! I can't recall any one moment in particular, although there's definitely a massive mix of emotions in this book - I remember myself finding a couple of moments in the book emotional, but at the same time there were some laugh out loud moments as well as nail-biting, edge-of-your-seat action scenes. I'd absolutely recommend this book to anyone - From action enthusiasts to supernatural fans, to people who are just looking for a funny read. It covers all bases and I'll definitely be listening to/reading more of the author's works. This is a solid formal debut from an independent author. Urban Fantasy is my favorite genre, and this edition does not disappoint. The protagonist, Asher Hearst, is multifaceted in all the ways you want your main character to be. The book is jam-packed with plot. Thinking back on it, I'm amazed everything was fit into a single release. There are wizards and witches with some intriguing magic, faeries (fae) of many varieties, a fair amount of action, not too much family drama, warm romance, noble acts, interesting side characters, and a straightforward plot with plenty of twists and turns. The book doesn't rely on too many stale urban fantasy tropes. The supernatural infrastructure isn't a focal point, but it feels fresh. Unless your sense of humor is way off-base, you will find yourself chuckling at and with the protagonist. The humor isn't shoehorned in, and Asher's attitude is as much of a superpower as his immortality. Though the immortality aspect is, of course, an important element, there is still a question of just how much Asher can really take. Considering he's going up against literal gods and inter-dimensional beings, his survival really isn't guaranteed. Indeed, I am not going to give away whether or not he does survive. It wouldn't be the first time an author sacrificed their main character. I can see how the narrator might not be everyone's cup of tea, but I felt he was good fit for Asher. He did a fine job portraying the secondary characters, as well. He hammed it up a bit with some, as you will find, but the ham seems appropriate in retrospect. I do hope Mr. Edgington is able to produce more works of a similar caliber. I will be one of the first to purchase them. “Immortal: Curse Of The Deathless” is about the trials and tribulations of an immortal named Asher Hearst. A college student and small-time fixer, Asher operates in the world of the supernatural. This book is filled with a variety of creatures and a plot that feels like it was secretly intended to be a supernatural action movie. Asher has a good sense of humor, which he needs, considering how much trouble he finds himself in from one moment to the next. There is a comic book feel to the story that I don’t necessarily think is a bad thing. I would say it just comes down to a matter of taste. The other thing that is a matter of taste is that the book feels like multiple short stories made up to be a novel. I think I would rather it had been either one novel length story or one book of short stories. With that being said, I still think “Immortal: Curse Of The Deathless” is an enjoyable read/listen. 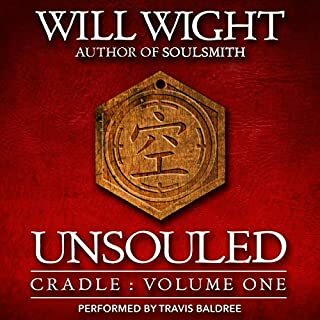 Finally, this audio book was provided by the author at no cost in exchange for an honest review courtesy of Audio Book Boom. Where does Immortal: Curse of the Deathless rank among all the audiobooks you’ve listened to so far? An interesting story, although the character does show lots of normal flaws he does seem a little resilient for even an Immortal , but I would advise that you stick with the story as it does get better. What was one of the most memorable moments of Immortal: Curse of the Deathless? The constant sticky situations that our hero Asher finds himself in stand out , his methods of extraction do take you by surprise and the action can be quite fluid. 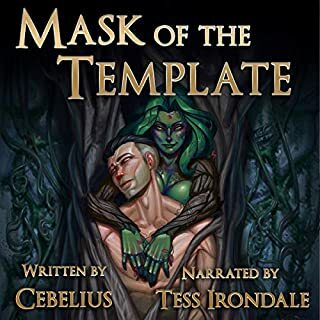 Dependant on price and availability I might either go the Ebook route for the next in series or try another audible now that im more used to the narrator.Overall I would state that this is worth trying out .This Audible was gifted to me in return for an honest review and as such is my own opinion and view. it was pretty interesting actually, liked that the plot was pretty solid and the humorous part of it was cool. Asher didn't seem to end a problem and was getting in another altogether how I never knew, he just had that luck, the twins were pretty comical. the character development was great and the twists here and there were well placed and exploited, it was a good listening. the second one sounds pretty interesting too for what I got from the preview and seems asher is coming back to the luck that make him what he is. What was most disappointing about Derek Edgington’s story? Who would you have cast as narrator instead of Nik Magill? I absolutely loved this book! There was just the right amount of everything in this book to make you want to read the next from the author! This is an awesome read and it leaves you wanting more !! There is never a dull moment in this book. The story plot, character, writing style and narration is outstanding. From start to finish it is thrilling and the passion in it I would definitely suggest this book to anyone as a great. I cant wait for more books from Author. 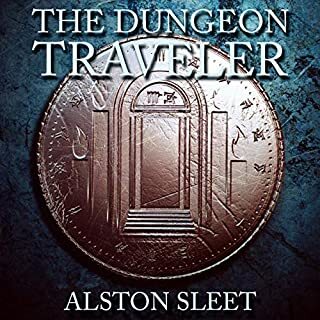 Derek Edgington crafts a world base on the real one but filled with all sorts of supernaturals hidden from most people in the same vein as other books like the Dresden files. It feels like there is a whole lot of history in this world that I would be interesting to delve into if we get a chance in other books. I would happily listen to another book that they have written. As the main character has limited knowledge to start with we get to learn along with them. This leads to a sold journey of discovery and development it is interesting as the character often knows they don't have a clue what will happen next The writing style fits the character well and as it is grounded in their point of view it keeps it tense and engaging as you can really get inside their head. If you get on with the main character and their sense of humor you will like this book. The book is well paced and keeps you listing to find out what happens next. I love the bar in this book, I only wish it was my local. 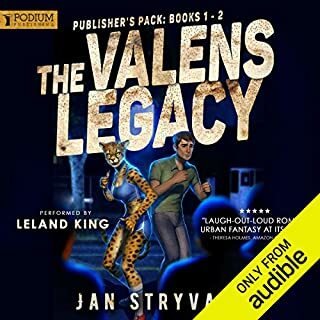 The narrator Nik Magill has a great range and does a wonderful job narrating.each character is given an unique voice that suits them. The characters come across as haveing real emotion and motivations. I would happily listen to another book narrated by them. This book started strong and ended well, if there were more hours in the day I would have finished listing to this far sooner defiantly was well worth a listen, I am very happy with the time I spent listing to this book and am looking forward to listing to the next one. This book was given to me for free at my request and I provided this voluntary honest review.